Many talented horses never reach their full winning potential because they get too nervous. When the stakes are high and the lights are bright even the best-trained horses can get anxious, frightened, or lose focus. This leads to frustration for everyone involved considering the large investment of money, time, and sentimental value that a particular horse may have. Our team of Ph.D. equine nutritionists understand how important it is for a horse to be calm and relaxed, yet at the same time sharp and responsive to the slightest of cues from the rider. We also believe in supporting a horse’s talent without the use of drugs. Outside of ethical concerns and the fact that drug use is illegal in most associations, pharmaceuticals can leave a horse dull and unresponsive to rider cues. 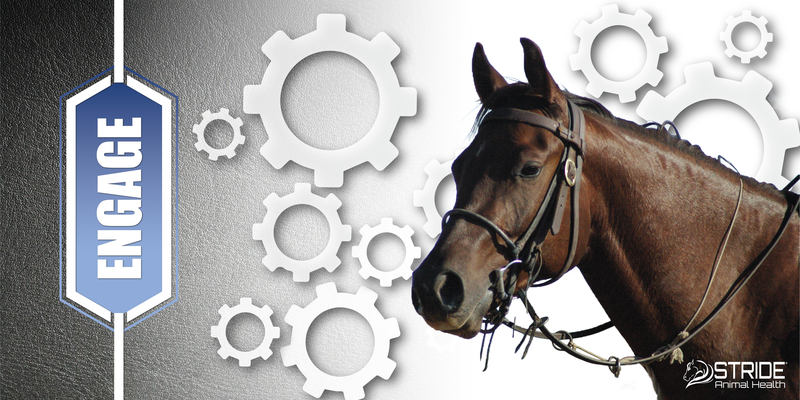 Engage was designed to calm a horse’s nerves while at the same time keeping them focused and responsive. Engage is different from other calming supplements because of its ability to cross the blood-brain barrier and influence neurotransmitters in the brain. A calm and focused horse must have a perfect balance of serotonin and dopamine levels in the brain, and the unique ingredients in Engage do just that. Horses learn while on Engage. Professional trainers have indicated that even seasoned horses actually learn faster after receiving Engage. In these instances, it can be used during training sessions to accomplish a higher level of retention. It can also be used for teaching horses how to load in the trailer and stand for the vet or farrier. Engage is a show safe formula and is available as either a paste or powder. It can be given in preparation for a one-time event such as a show, farrier visit, or training session. It can also be used at multi-day shows or sales. Bonus Tip: Helping a horse stay mentally stable involves providing a solid training foundation and good horsemanship, but the diet is also a contributing factor. Research shows horses fed grain meals high in starch and sugar (such as oats and sweet feeds) are more excitable. Therefore a good rule of thumb is to select feeds which have an NSC content of 22% or less. NSC stands for non-structural carbohydrates, which is starch + sugar. Bluebonnet Feeds offers a variety of low starch feeds, such as Intensify Omega Force.